Man on Wire doesn’t offer any moments of great cinematography. It doesn’t present enveloping multi-channel surround sound. Instead it offers up one nutty Frenchman’s pursuit of a far-fetched, ridiculously crazy, life-risking dream. It’s a true story and what it offers is plenty of food for thought. Even though Man on Wire is a simple, low-budget production, there’s a joie de vivre on display that is unmistakably French and there are moments of whimsy that seem plucked straight from a Jean-Pierre Jeunet fantasy. The movie starts “once upon a time,” like all good fairy tales, whether they’re imagined or real. Philippe Petit was in a dentist’s office in France, reading the newspaper while awaiting his destiny in the chair. He came across a story about this magnificent project going on in New York City: the World Trade Center was under construction and was poised to tower above all other skyscrapers. Using a faux sneeze as a cover, Philippe ripped the story out of the paper and left the office in a flash. As he puts it, he traded in a toothache for a dream. And that dream? To rig a tightrope between the two towers and walk across it. The bulk of Man on Wire follows Philippe through his planning and plotting of this feat, which at times rightfully feels more like a heist flick than a documentary about a “harmless” high wire act. 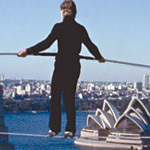 On tap is vintage footage of Philippe walking between the towers of Notre Dame in Paris and performing his highwire act at a bridge in Sydney, Australia, with busy, bustling traffic zooming underneath him. James Marsh’s movie combines brand new interviews, dramatic recreations, and historic footage from the World Trade Center’s construction and inauguration to revisit New York in the early 1970s. At this point, it might as well be a different world. At the towers’ opening, the Twin Towers were declared a symbol of world harmony. Naturally, in this post-9/11 world, that footage takes on a haunting irony. But, while Man on Wire undoubtedly gains a certain amount of power from the unavoidable thoughts about how the world has changed with both the creation and destruction of the towers, the point is to share in Philippe’s unique quest. The interviews with Philippe and his friends are oftentimes a hoot. They struggled to figure out a plan, they struggled to patch together a trusted team of cohorts. When the team expands to include a pot-smoking musician and a carpenter, one of the original members quips how the newbies were a couple losers. Great. And a life is on the line, both literally and figuratively. The date is set: August 7, 1974. Philippe sounds downright excited about the prospect of “a beautiful death,” one in which he dies during the exercise of his passion. At the other extreme, one accomplice recalls his “unbridled glee” when he bails out on the mission and runs down the stairs of the World Trade Center. Another is afraid he might be accused of involuntary manslaughter or assisted suicide; the United States, after all, has a reputation for being such a litigious country. Those extremes are at the heart of Man on Wire. This is a genuine, heart-felt movie about people, their dreams, and the crazy world that has so much to offer for those willing to step out on a limb. And the theme here is that, if you really want something, nothing is impossible. Unfortunately, that sentiment can also apply to the perpetrators of the events of Sept. 11. Philippe’s life changed after his stunt and the relationships between the core members changed. Not all of those changes were for the better, but that’s one area where this documentary stops short. The bittersweet aftermath of Philippe’s dreaming out loud and making the outlandish happen is glossed over, which is unfortunate because that could’ve elevated this highly entertaining little documentary to something even more substantial. As it stands, Man on Wire still achieves a certain level of pathos. After being arrested for trespassing and disorderly conduct, Philippe was ultimately presented with one last souvenir of his success. He received a lifetime complimentary pass to the observation deck of the World Trade Center.